Morgan Bassichis’ Damned If You Duet presented at The Kitchen at the start of November. It was a joy inducing show of songs-for-two, where Morgan performed together with Malik Gaines, Ethan Philbrick, Mariana Valencia and child star Helen Messineo-Pandjiris. 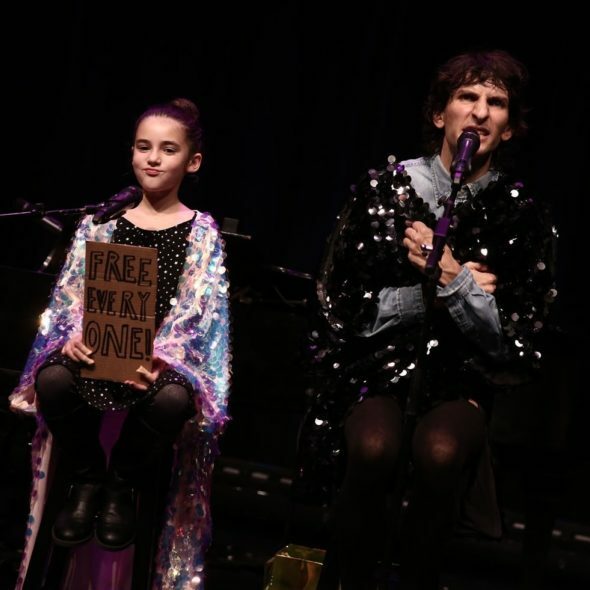 Morgan and Helen, who is 9 years old, gifted each other shiny sequins capes, which they wore during an exchange that was both tender and political. Here, they speak to each other, post-show, about what it felt like to collaborate, what the future holds for them after the performance and what are the things they want to change about the world. Morgan Bassichis: Should we light a candle for our conversation? Is there a like a blessing we should say? Helen Messineo-Pandjiris: Let’s hope that we just be ourselves. MB: How are you doing post-show? What kind of feelings did you have afterward? HMP: Kind of sad. Suddenly the show wasn’t happening and I was missing everyone. It was weird not having rehearsals on the weekends. MB: I like to call it post-Bat Mitzvah blues. After you have a big thing and then you’re like: “where did everybody go?” What was it like to perform on that big stage? HMP: It was really fun that we just be ourselves and have a good time. MB: What did you learn about performing? HMP: Don’t touch the mic during the performance and that you should just be yourself… and, don’t touch the mic! MB: If you remember nothing else, that’s the most important thing. HMP: Yes. And sing loud. MB: Why was it so important to not touch the mic? HMP: It just sounds better if you don’t. And singing loud is important because you might think it’s really loud from your spot, but actually, to the audience, it sounds not loud. MB: It sounds much louder in our heads. What’s a duet? HMP: A duet is two people working together and doing something together. In a solo, you’re by yourself and don’t have anyone with you. But in a duet, you have someone to have fun with. And I think, personally, I love being in a duet. This is my first time doing one. MB: You’re mostly a solo performer in the past. HMP: Yeah, it’s nice to be two people because it’s easier to talk to someone and easier to do stuff together. At my house, it’s just me and one other person. So I’m used to being with two people. MB: It’s a playdate in front of people. What’s the difference between rehearsals and performances? HMP: Well at a rehearsal, you’re practicing and working to be better. But then at the show, you’re showing what you’ve done. It’s like the reward. You’re showing what you’ve learned. It was especially cool because this is my first big performance. MB: You did so great. I think you’re right. For me, the work happens in the rehearsals. That’s where you really put the work in. Why do you think we chose duets as a theme in this scary, bizarre moment of the world that we’re in? HMP: I’m not quite sure, but maybe because duets make you happy. MB: Totally. A lot of people said that the show was really joyful, which is not an everyday thing for people right now. HMP: It’s cool because the audience motivates you to do it. MB: If you can change three things about the world, what would you change? HMP: Our president. Global warming. MB: Are you for or against our president? HMP: Against our president, obviously. MB: You want him out of there? HMP: Yeah. And maybe for my third thing, to have everybody feel happy. MB: I want that too. What would people look like when they’re happy? HMP: They would not be sad and want to be more around others. MB: Maybe we could magically transform all the pollution into a dance party and turn into compostable costumes. If you were to throw a costume party, what costumes would you ask people to wear? HMP: I would ask people to wear as crazy as can be. With your most crazy things, but you have to reuse something to make your costume, like plastic bottles or even maybe a rotten apple. MB: I could go as an apple orchard or a message in a bottle, and I’ve got a secret message in the bottle that says: “you’re wonderful”. HMP: Yeah, everyone would pick from the bottle to see what their fortune is. MB: Now let’s talk about acting. What roles do you want to have as an actress? HMP: I want to be a comedian. Because it’s fun and people say I’m good at it. And an actor and maybe a dancer and a singer! MB: A quadruple threat. You can do it all. Maybe also circus performance. MB: Puppets! Stilts! You’ve got it. You’ve got the IT! And are there any movies, if they decide to do a remake, that you’d like to star in? MB: I haven’t seen that but I know it exists. HMP: Gilmore Girls. I would want to be Rory. MB: Gilmore Girls next generation. Rory. I have no idea who that is but it sounds wonderful. What would your take on Rory would be? HMP: Rory, but on the other side of being smart. Being a performer. HMP: Yeah, her hidden talent is being a singer. MB: What else do you want to be in the revival of? HMP: Maybe if there was a remake of Big Business. MB: Wait, what? YOU have seen Big Business, which is my favorite movie of all times? HMP: It’s my grandma’s too. It’s probably in the top 5 most favorite old movies. MB: [laughter] Are me and your grandma the same age? That’s amazing. Did you think of yourself more as the Lily Tomlin character or Bette Midler character? HMP: But I would be the boss and the country one. MB: And I’ll be Lily Tomlin. Lily Tomlin and I share a birthday. And she’s my favorite performer in the whole world. So I would be honored if you would allow me to play her and you can play Bette Midler. MB: Okay. Thank you. So maybe you and I would star together in the remake of Big Business. And it would be confusing for people because the characters are born in the same time, but you and I have a slight age difference. MB: How many years difference do we have? HMP: I don’t know, like 10? MB: Great, so that would put me at 19. Perfect. So they’ll call us to remake Big Business. You’ll be the powerful New York CEO, and then the country singer who dreams of moving to the big city. HMP: Yodel yodel Yodlee hee hoo! MB: We’ll do a contemporary retake. HMP: I have a question. If you had any other job, what would it be? MB: This is a good question because I was born to perform. HMP: Me too. That’s one thing we have in common. Do you have any hidden talents? HMP: I have one. I’m really good hola-hooper. I’ve never measured how long but I can keep the hoop on for quite some time. MB: I would say my hidden talent is I’m really good at organizing people’s closets and possessions. HMP: Oh, you have to come to my room. MB: Do you struggle with organization? HMP: Well, I’m good at organizing my desk, but I hate organizing my room. MB: What’s the problem area? HMP: I just need to reorganize my room at both houses. MB: That’s right. You have a lot to cover. HMP: And I have to get some new toys because I’m at that age where it’s toys in the middle of toys. That stage of toys and electronics. MB: What do you mean? Like you’re transitioning to electronics? HMP: I don’t really like any of my old toys that much. I don’t play with them that much. MB: Do you need to have like a little “I love you so much but I have to let you go,” is it a break-up? Is it a funeral? What is it? MB: You can have a good cry and move on. So you don’t do stuffed animals anymore? HMP: I have to sleep with them. But I don’t really like playing with them. MB: Do you think they have a soul? Or are they just toys? HMP: It’s nice to have them sitting there. MB: Totally. Just a little helper. Some extra support. Some extra love. HMP: Do you have any pets? MB: I would love to have a dog. Every dog I see in the streets, I get very emotional. And I have this joke I tell every single dog owner: “you stole my dog.” And it doesn’t really work as a joke. If you were an animal, what would you be? HMP: Maybe… a bird? So I could go everywhere. But birds die a lot. MB: You’d be a bird that lives a long time. Do you want to be a big bird or a small bird? MB: Okay. So. For the few last minutes should we do a “Yes, and” conversations? We can go wild. We build on the other person’s thing. So it’s like a conversation duet. MB: I’m just so excited to meet a turquoise bird. I’ve never actually met one in real life, so it’s a real honor to meet you. HMP: Yes, and I love seeing birds, other birds. But I do like me the best as a bird. MB: As a turquoise bird, you’re very popular among birds. Popularity seems like a double-edged sword. How is it for you to be such a popular bird? HMP: I manage it. I manage it well. Well as we’re talking here, I’ve turned back to human form. I’m just really loving your shoes. MB: Oh, thank you so much. These shoes are actually specially made for me to look like I’m a mermaid. So, I am currently in my mermaid-shoe outfit. HMP: You have to give me some tips on those shoes. MB: Absolutely. I know that you’re very active on social media. It seems like a lot to manage. Is it competitive to place a product on your social media or is it easy? HMP: Not really, because I’m kind just being myself. MB: That’s the brand people want. What kinds of things are selling right now? HMP: I’m selling these new kinds of sharpies with multiple colors in one. MB: What’s your favorite color in this new multi-color sharpie in one? HMP: I have so many favorite colors, but I like turquoise. My favorite color switches a lot. MB: It’s so interesting that we’ve both decided to be humans right now because we are so many different things at so many different times. It’s almost faith that we’re both humans right now on this rainy Tuesday. I think I might turn into an umbrella next.